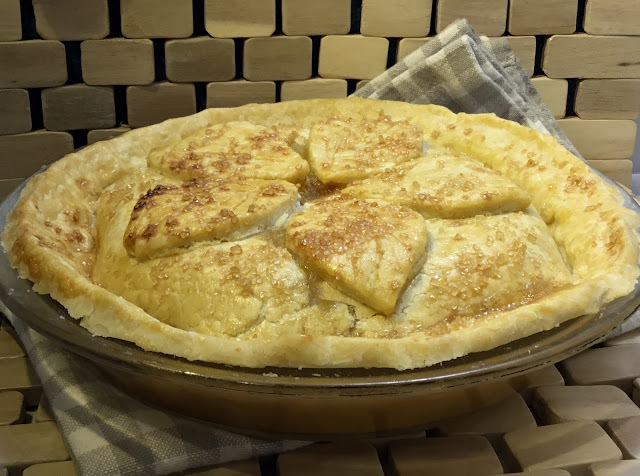 The shortness of this short-crust pastry, goes perfectly with the light and fluffy, sweetened, stewed Bramley apples. Preheat your oven to 230'C / 450'F / Gas 8. Place the prepared the apples into a pan and add 1 tablespoon of water. Heat and gently simmer with the lid on, for about 15 minutes. Remove from the heat, then stir in enough sugar to sweeten to your taste, about 2-3 tablespoons. Place into a 20cm pie dish. Meanwhile, roll out your pastry onto a floured surface, a little larger than your pie dish. Dampen the edges of your pie dish with water and lay your pastry on top. Trim off any excess, then pinch with your thumb and fingers around the edge, making a shallow 'moat' around the inside edge. With the trimmings make pastry leaves to decorate, and brush with beaten egg. Sprinkle with a little Demerara sugar, and insert a knife into the top of your pie 3 times to allow air to escape during baking. Bake for 10 minutes, then reduce the heat to 190'C / 375'F / Gas 5 and bake for another 20 minutes. Note: You can use a pie funnel if you prefer.